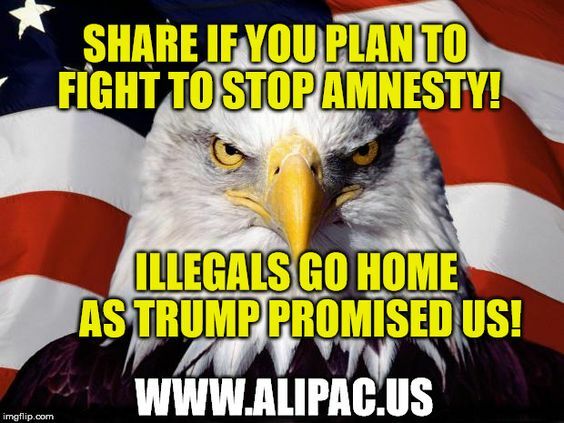 Will you fight Amnesty Monday? Thread: Will you fight Amnesty Monday? If the leaked White House document regarding Trump's amnesty deal is correct, this nightmare is worse than anyone imagined! Please review Breitbart's report (View) and the video from DML (View). There is a huge backlash going on out there on social media and many Trump supporters are split on the issue as you can see (and weigh in on) in the comments beneath the Breitbart article! The Amnesty plan is supposed to be presented tomorrow! A VERY GENEROUS ALIPAC SUPPORTER HAS OFFERED TO TRIPLE YOUR DONATIONS UP TO $500 to help us Stop DACA! Please take this opportunity to turn your $10 donation into $30 or your $50 donation into $150! Last edited by ALIPAC; 01-28-2018 at 05:39 PM.